Paul Laus, a native of Beamsville Ontario, was drafted by the Pittsburgh Penguins in 1989. Following that, he was selected by the Florida Panthers in the 1993 expansion draft and ended up spending his entire career with them, becoming one of the most beloved and feared players in NHL history. In 2001 he earned the Captaincy of the Panthers after Scott Mellanby left to play for St. Louis. 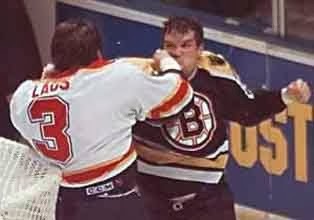 Laus finished his career with 1702 PIMs (177 from fighting majors), 88th all-time in the NHL. In the 1996-97 season he set an NHL record of 39 fighting majors which still stands today. Paul Laus has been kind enough to answer some questions for PensInitiative, providing a player's real perspective on fighting. 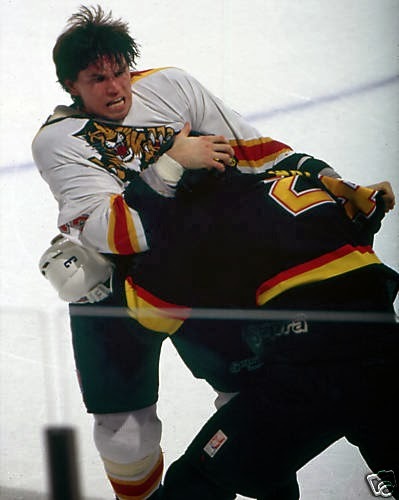 Fighting in the NHL has undoubtedly changed since the late 90's. With the Parros concussion and possible retirement looming after the recent Orr KO earlier this month, the debate over fighting is already heating back up this year. What changes do you notice in the "enforcer" role in the league today? "I am not a fan of the "staged" fight . Play hard and play fair or play outside the rules and watch your back. The head shots are becoming more frequent than ever, so a role is becoming less than before, instigator rule has changed the enforcer rule and now I heard junior hockey has a rule of a fight in a game and you are thrown out, will the nhl be next to implement this? Time will tell. The biggest change is the 2-3min a game enforcer is obsolete ,now you either have to play good defence , chip in a few goals or be a good penalty killer , something more than just a fighter. Has the mentality changed behind fighting? Was about its role in actual gameplay? I know the rules have changed and in the future it will change, hopefully it won't . Back in the 90s every team had at least two guys that would fight on any given night." Concussions, depression, and even chronic traumatic brain injuries are generally cited as direct results of fighting on the ice. Do you now, or ever have, seen it as a legitimate threat to player safety? Enough to change the rules surrounding scraps? "(I have) Not seen any direct similarity between the two but after all the studies of the brain being hit or concussed I am sure there is short and long term damage to a players health. There is always a risk when you play hockey , or work on a assembly line ,there is always a risk, at any occupation." Yzerman has recently suggested that fighting should carry a 10min penalty and a 1 game misconduct, and this year the NHL is mandating that helmets stay on for fights. Do you think that the league needs to police it's players or let them assume the risk that comes with fighting? "Well I would have to say from personal opinion if helmets were removed I may still have played a few more games , I believe that my career ended on my hand hitting another players helmet , so I am very biased on that. " Can you walk us through a "staged fight" (fight right after faceoff)? Would you say it benefited the team, the crowd, yourself, shift in momentum, or all of the above? "Never had a "staged fight" there was always a meaning behind every fight , time,score,cheap shot , there was always a reason . You know going into a game who will or won't fight, timing a fight I believe can be a momentum changer gets crowd off their feet." What do you think are the long term health effects of being an "enforcer"? "Fighting at its core is brutal two players bare knuckled throwing punches at each other. During my career I may have had a few concussions and never knew. hands hurt in mornings and when it is cold outside. Would I want my son to be put in a similar role (no way) end of story. " What place will fighting have in the NHL in 10 more years? "It is always been and always will be popular to see , it makes highlights on every sports news cast, in 10 years I think it will be drastically limited , weather through suspensions or penalties . So many fans love to see it and so many dislike it. It will always be split on people that like and dislike it."